Bloggers Challenge Week 49/Hanna 18 Tennis Friend?? The Bloggers challenge this week was to create a card with Animals and of course my favourite animal is sweet little Riley. The Hanna Challenge was to use the paper piecing technique on a card and add a little bling. The tennis racket is a streamlined metal version created with Cinnamon Stickles. Do you like Riley's little outfit? I used Basic Grey Archaic DP for this creation. To participate in the Hanna Stamps Friday Challenge go to Splitcoaststampers home page and click on the Hanna Stamps icon. To view the cute crittePublish Postr cards made by my fellow Bloggers, click on the Bloggers Challenge icon on my sidebar. 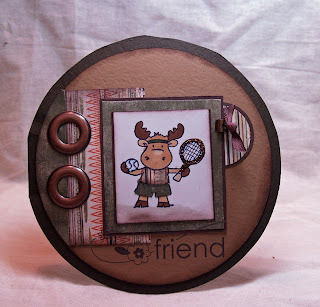 Recipe: Hanna Stamps Riley Moose, Prism Cardstock: Tawny Medium and Birchtone Dark. Sometimes I am late...............really late............a few minutes late for work, really late when it comes to getting into bed at a decent hour. Although I have quite a few type "A" characteristics with hints of perfectionism..........the type "B" in me guides my schedule. I had a bit of a rough week last week, which had some negative influence on my creative flow. Fatigue, coupled with higher levels of emotional arousal left me at a loss to do much but be lazy! Sometimes when I feel that way, it's helpful to push myself to be Unlazy.........to get out of the house.....dress extra nice intentionally and remind myself that continuing to feel this way will not be productive. Grey moods and negative emotions can have a spiraling effect unless they are attended to. Reminding myself that I am responsible for keeping myself down, I was able to pull up, but not without effort. I made a promise to my self last night to start moving in the morning. A brisk walk before work to start my day. I was close to going back to bed, but reminded myself that I had told my neighbour that I was going to walk. I am sure that she wouldn't have been disappointed in me, but sometimes sharing your goals and plans with others ensures that you will commit and follow through. And I enjoyed my walk this morning.............listening to my favourite music, the strong sweet scent of Lilac fragrant in the air, enjoying the birds and the deer and the cool breeze on my face, I told myself that this week will be better. And I am positive that it will. Anyway, I kind of lost myself there for a minute : ) . This card was created to cover two challenges. 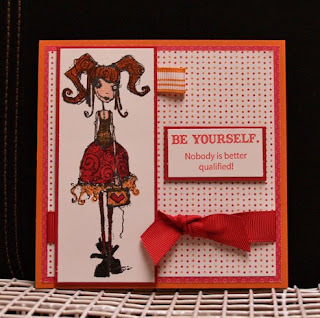 My Friday Bloggers Group Challenge as well as the Hanna Stamps Challenge that is played each Friday in the Hanna Stamps Forum. You can access both Splitcoaststampers and The Bloggers group from my Sidebar. The Bloggers Challenge was to create a Red, White and Blue Card, the Hanna Challenge to use Chipboard. I created my own Background on the card, by stamping a small flower stamp to the cardfront, filling in the petals with a Sakura White Gel Pen and the Red Middles with my second addiction, next to chocolate-stickles!. The main image was coloured with Copic Markers. I used Stampin' Up! Real Red Craft Ink to cover the chipboard flower-so much quicker than paint! and had to add some polka dots to it of course!!!! Hodgepodge brushed silver hardware is the base for the sentiment and a SU! Ice brad adorns the middle of the flower. To all my American friends, have a safe and happy memorial day !!!!!!! You might have noticed the latest little link in my sidebar, but I want to make it official. 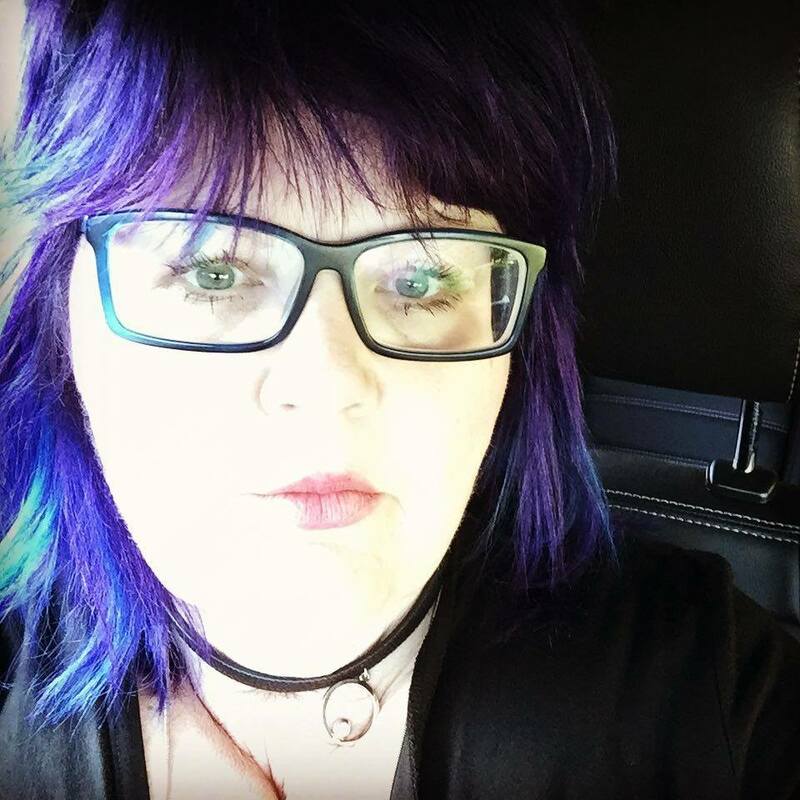 I was contacted by Lindsay over at Tweety Jill Publications to see if I would be interested in joining their design team. I am very excited because not only does Tweety Jill offer excellent idea books, they also have a wonderful array of collage type rubber stamps. I plan to play with them this weekend and post a few samples for your viewing pleasure. 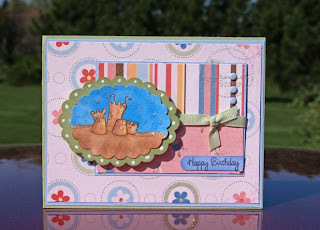 You can see my BEACH BABE Cards over on their Blog. 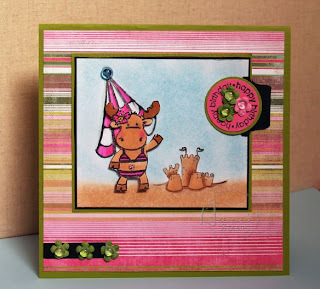 The images are from SPF 50 the latest releases from Hanna Stamps. A Huge Thanks to Lindsay Haglund for offering me this wonderful opportunity to work with a fabulous creative company. This has to be one of my favourite images from the Hanna SPF 50 set. That is probably quite evident, given my last post featured this image as well. This wonderful sketch was our Bloggers Challenge group Challenge this week. 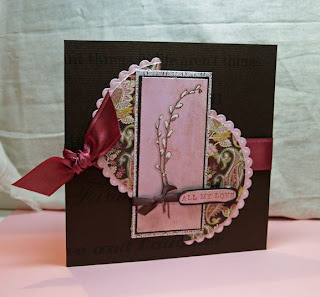 I combined it with the Hanna Stamps Design Team Challenge, which was to use a brayer. I stamped the shell images onto Glossy Cardstock with black Stayzon ink. After letting the ink set, I brayered over the images with Creamy Caramel Ink after using a white crayon to cover the areas that are showing as white on the background. Well the background looked pretty plain still, so I stamped dots in Creamy Caramel. The background was STILL not doing anything for me, so I added some more dots in Teal stayzon. The sentiment is a Rub on from Stampin' up!!!!! I used Taken with Teal Cardstock, combined with Prism's Medium Suede Brown. Want to check out some beautiful designs made with this sketch?? 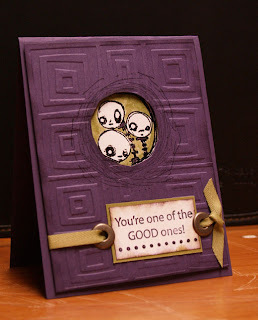 Follow the Side Bar to see Bloggers Challenge group Creations. To see pretty brayer tecniques, visit the Hanna Stamps Member Forum HSC17. or would we really? Building Sandcastles can be fun, but then it can also be quite a tedious task, like being a mother. You need the right mix of sand and water to make a castle that will withstand the wind and tide. As a mother, you need the right mix of love, discipline, modelling........you need to be fun, but firm, know when to assist and when to let our children learn lessons the hard way. When our children are small, their tragedies are often solved by a hug or a kiss, finding that blanket or stuffie or placing a bandaid on a barely visible boo boo!! We seem to be able to protect them quite easily. The mother is capable of being the strong form that molds and protects the wondrous creation as their personalities and characters develop. As they get older, that becomes more difficult. We are no longer the only influence in their world. Problems become more complicated and real, others begin to have an impact on shaping our little ones points of view, attitudes and behaviours. The motherly mold begins to lose it's rigidity, allowing the little castles to shift their shape and transform into unique people, yet at the same time remains solid enough to provide a base that will withstand the storms that one has to endure. I believe that part of the joy of being a mother is to have successfully worked through those difficult times, to process with your child the emotions behind the anger, to wipe the tears, to see the smiles on their faces when they have independently implemented a solution or completed a challenging task. Building Sandcastles on a Sunny Day at the Beach can be such fun but there is the imminent threat of having all your hard work washed away over time. The work that we invest into our children however, withstands the tide, the wind, the rain and the form that we provide remains in a place deep in our childs heart. Wishing all the Mother's who are reading this post a Wonderful Wonderful Day! Created for Beate's weekend Sketch Challenge-Click Fresh and Fun on my Blog Roll. because it's a beautiful day and because the Flower beds need attention, instead I prefer to work with earth inside..............earth tones, that is!!!! The truth be known, I am a horrible gardener, it is not something that I enjoy and quite frankly, plants ought to steer clear of me, I have a tendency to kill them........not intentional, but inevitable!!!! 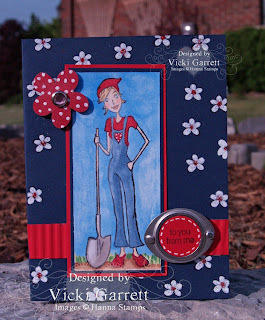 So I created this card for the Design Team Challenge that is posted each Friday over on the Hanna Stamps member forum. Shannon, our hostess for this week challenged the members to create a card using Creamy Caramel, Ruby Red and Always Artichoke. As you can see, I used all three on my card base. 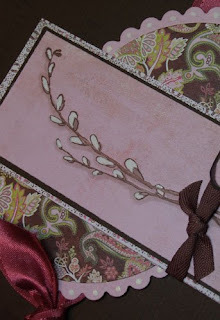 Panels of colour were embossed with the Cuttlebug embossing folder for extra texture. 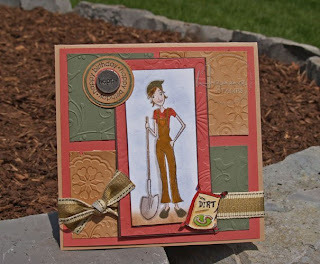 The image comes from the Garden Stamp set that is now available over at Hanna Stamps. I coloured the main image with Copic markers. Ribbon is from Cosmo Cricket and the little metal "happy " embellishment is from the local $$ Store. Enjoy yourself today and Play safe!!!! I can hardly believe that my Friday Challenge will is up before Friday. Quite often, I actually challenge myself on Friday, so I don't get around to posting until Saturday, but this week I am ahead of the game. Is it because of my wonderful organization skills you ask?? Definitely NOT!!! I always work well under pressure. This week I am ahead of the game for a couple of reasons. Wednesday's Sketch challenge was SO inspiring to me that I decided I needed to use it for my Mother's Day card. Did you know that this sketch was designed by Lynn Mecurio, who is a member of our Bloggers Challenge Group? Secondly, My Mother is wonderful (although we bicker sometimes and she continues to remind me that, in her opinion I am going through the change of life) and is deserving of a pretty card. She does so much for myself and my son and although she isn't so silent about it, she can be very selfless. A lot of the times in my life when I SO did not want her to be right, she WAS and as I grew older, I learned to value her opinion and her excellent ability to read people. So here's to you Mom. You raised me well and you continue to nurture and love us as we are, albeit frustrating at times. Even though I don't tell you how I feel often enough, I love you, your strengths, quirks and even the faults that make up your persona. I hope that I am fortunate to celebrate many many Mother's days with you. Anyway this image is such a fun one for me. How about the new Archaic line from Basic Grey. I just Love the earth tones and fun and funky patterns. The little banner comes from the Airplane Riley Stamp. It works with all sorts of small sentiments and rub ons too!!!! I have had Sakura Glaze pens in my stash for a long long time and never used them. You can't really see, but you would be amazed at how the pens make the bike look like black metal. These are Super Pens and cover really really well. What about the sketch??? You can find it on the Wednesday Sketch Challenge on SCS today. Just go to the Homepage and click on the Wednesday Sketch Challenge. There are some phenomenal cards over there!!!! 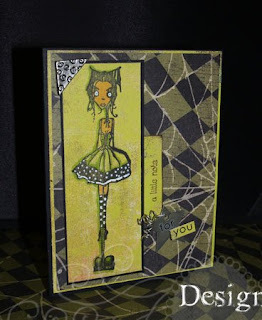 I have a fascination with Gothic Style and So these Stampotique Images appealed to my eye immediately!!! As I had indicated in my earlier Post about Stampotique stamps, I was overtaken with glee to see these "beetle juice" type characters in all their glory at the Stampotique Booth in California. Once I mustered up enough nerve and with a lot of cheerleading from my good friend Kristi at Hanna stamps, I spoke to Carol and Jim about doing some design work for them. The lucky stars where shining upon me that day because they said Yes!!!!! And SO, a couple of weeks ago a package of these simply adorable characters arrived at my door. This is Gooseneck. She is just one of the many images available on the Stampotique Website. Go take a look, but be prepared to surf for awhile as there must be well over a thousand images over there! I stamped her on Patterned paper from Basic Grey (stamping on Designer Paper cuts down greatly on your colouring time), which meant that I only had to add a shading of marker to the greens to add dimension and highlights with my white gel pen. The DP in the background of the card is from Rusty Pickle. The sentiment from the elzybell collection. I used Stampin Up! Rub ons to embellish the metal star and some curled wire to ground the sentiment. I am not the only one who thought these images were absolutely adorable. My New stash of stamps arrived just a day or too before my Victopia weekend. The girls were also very impressed with the images and quality of Rubber. This card was made by Judy Workman, a fellow member of the Hanna stamps design team. She used a background of Archaic paper to showcase this multi image friendship card. And last, but certainly not least, Moffia is featured here by friend and card artist Anne-Marie Bouthillette. All of the girls were very impressed with the quality of the deep etched rubber stamps and I know of at least one who became equally addicted to the art of Daniel Torrente and who should be receiving her own package any time soon!!!! Keep watching, I have more ideas to come! Internet Problems-Doesn't that just get your goat! It got my goat this week, in fact it drove me round the bend, frosted my pumpkin and almost had me wiggin' out (lol!). Once I resorted to the fact that I may as well just relax and post when everything was settled down and working, I was all better! When you learn to think differently about a situation, you can quite readily reduce stress and negative emotions. Once I told myself a far worse fate than having no internet service could be bestowed upon me, I was able to focus on other things and actually get a little cleaning done!!! I used Prism Cardstock as my base for the card. I love the weight, sheen and citrus like texture of this yummaliscious paper, which comes in a rainbow of colours. I used Intense Kiwi.......even the name sounds delicious!!! The striking Striped paper hails from Basic Grey Sultry collection...........simply candy for the eyes!!!!! The challenge was to combine stamp sets to make one card. 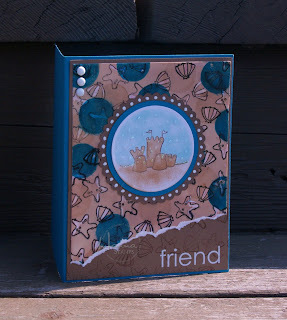 I used the Umbrella and Sandcastle from Fun in the Sun, one of the latest releases over at Hanna Stamps. Sweet Sophie is the scene stealer here!! Don't you love her Belly Button Bling Bling?? Primas, Dew Drops and Stickles give the finishing touch! Stay tuned for a Feature on Stampotique tomorrow!!!! !